Hair extensions can help you to add length and volume, but they can also help you to quickly achieve a stylish hairdo on those mornings when you’ve only got five minutes to fix your hair. We’ve picked 5 hairstyles and found 5 hair extension solutions for when you’ve only got minutes to get ready. All you need is a ponytail hair extension and you can achieve this style quickly and easily. Start with dry hair and backcomb hair at the crown to add a little lift. Take a pea sized amount of serum or gel and gently comb through the hair to smooth the top, taking care not to remove any of the volume at the crown. Gather the length and tie in a low pony at the nape of the neck, making sure it’s tidy and smooth. Then move the pony slowly to the side, to behind the ear. Fix the ponytail extension over your natural locks and wear over the shoulder. Spray and smooth any stray strands. We know how easy this style is when you need to get ready quickly. But a ponytail hair extension, or clip on hair extensions, can add a little more volume to your top knot. Gather hair onto the crown and fasten. Tie the ponytail extension or clip on extensions. Then start to twist hair. Start by rolling around your fore finger and keep going until you reach the tips. Pin in place and spray to secure. A simple way to update your plain and boring ponytail is to add a little texture. Use clip on hair extension to add a little volume. Start by backcombing at the crown. Instead of pulling hair into a ponytail in one go, do it in section. This helps to add texture and it means you don’t lose any volume. Tie the ponytail high. Back comb the pony itself as well and add a little serum to the ends. Run your fingers through your dry hair to comb, without loosing any weight. If you have fine hair, clip on hair extensions will add a little volume here. Plait hair starting at the nape of the neck and fasten at the ends. Twist the plait loosely and pin in place, hiding the ends under the bun at the nape of the neck. Exactly the same as above but for a little extra length. Instead of starting your plait at the nape of the neck, start halfway down the hair. Instead of plaiting loosely, plait tightly here and then fasten at the ends with a contrast bobble. Use hair to frame the face and perfect that “what, this old style?” expression. Everyone wants to be healthier. We want to regularly drink 8 glasses a water to keep ourselves hydrated, we aim (we do, honestly) to eat five portions of fruit and vegetables every day. But we fall into bad habits. We all do. And nowhere more than with our hair. When it comes to hair we often think that because it grows back we’ll always get a second chance. Yet that’s not necessarily the case. Our hair is very much a reflection of what you put in, you get out. Our bad habits can even extend to how we look after our hair extensions. Whether clip ons, weaves, sew ins or wigs, 100% human hair needs to be looked after because if you don’t it ends up the same way as your own hair does if you mistreat it; split ends, dry, brittle and no shine. What are the bad habits you need to break. Here we list them and tell you exactly why they’re bad for your locks, whether you wear hair extensions or it’s all natural. Heat is bad for your hair. There’s a protective band around each strand of hair, even on 100% human hair extensions, which is what gives it that shine and bounce. The problem with straighteners is that they gradually rub off that coat and expose the delicate strand underneath. You might think you’re making your hair straighter and taking care of it by using a heat protecting spray but actually you could be making it direr, brittle and frizzier. At Dream Girl we always say never use hair straighteners on hair extensions; you’ve made an investment and why would you want to shorten the life of a product you’ve bought. But if you shouldn’t use them on hair extensions, why would you then use them on your natural hair? There’s an old saying that you should brush your hair 100 times a day until your hear the “squeak”. The reality couldn’t further from the truth. Brushing is actually fairly stressful for hair. All you need to do is de-tangle it. Pulling and brushing strips hair of natural oils making it dry and brittle. You could be reducing your hair’s natural shine by brushing it too much. It’s the same with hair extensions. Ever brushed so much hair becomes static? That means you’ve created too much kinetic energy in your hair and you could make it frizzier. We wash our hair too often. The truth is hair doesn’t need to be washed every day with shampoo and conditioner. The grease we have on our hair is a build up of natural oils, but you’re getting yourself into a vicious cycle when you shampoo too often. You’re stripping back oils and then your body needs to restore them. You can stimulate over production as your body is trying to keep up with the shampoo-ing. Instead, wash your hair every few days rather than every day. Use a dry shampoo on your fringe if it needs a quick refresh but after a couple of weeks your hair will reduce the amount of oil it’s producing. If you wear hair extensions always use a suitable shampoo and conditioner designed especially for processed hair as normal shampoo might be too harsh and do permanent damage. We know; you shouldn’t use a hair dryer and now you shouldn’t towel-dry? How are you meant to dry your hair. It’s all about being gentle. Vigorous towel drying will pull and yank on your hair follicles and cuticles which will in turn damage it from root to tip. You also don’t want to comb or brush hair while it’s too wet. Instead, use your towel to squeeze out the excess water but don’t rub the hair or the scalp. Comb while it’s still damp and then dry. If you use a dryer then make sure it’s on a cool setting. No heat! This is where a healthy lifestyle and healthy hair come together. Drinking plenty of water and eating a diet that’s rich in vitamins and nutrients will result in healthy and shiny hair. If you’re regularly dehydrated or you’re not getting the vitamins you need your hair will be dry, lank and dull. There are plenty of pictures of our favourite celebrities cutting their hair for spring this year. Yet sometimes you see a longer style that’s just so right it makes you wonder why you’d ever want to get rid of your locks. Selena Gomez was snapped with the kind of beach waves we dream of having everyday. Thick, wavy hair, rich in colour looking healthy and shiny this is the hair we want for this season and right through until summer. The good news is that Dream Girl the ingredients for you to recreate this style. Whether you’re a brunette like Gomez or a blonde it’s easy to style yourself. What makes this style truly eye-catching is that Selena Gomez has seriously thick and long locks. Whether it’s all her own hair or she’s had a little help we don’t know but you can boost your natural locks. Use clip-on or longer lasting hair extensions to add both volume and length. The first thing you want to do is take a look at Dream Girl’s range for Waves and Curls. From gentle beach waves to French Jerry Curls this is our range of hair extensions designed for all those without super straight hair; and we know there are plenty of you! Pick the style of waves from Body to Italian Body as the wave and curl gets deeper and more defined. Next choose your colour. You want a shade that closely matches your own so that hair extensions blend seamlessly into your own locks. It doesn’t matter what colour your hair is; go from brunettes to blondes, reds or even funkies for a shock of colour. We’ve over 80 shades to choose from so you’ll find the exact right colour for you. Once you’ve chosen your colour choose the right length. Going from 12″ to 18″ you can opt for mid length to super-long. Selena Gomez’s hair here is really long, sitting underneath the breastbone. Remember you can have your hair extensions fitted and then go to your stylist if they need to be trimmed or styled so that they are the perfect length for you. Remember, never use heat to create waves or curls. Heat, like curlers or straighteners, is the fastest way to damage your locks. It’ll dry it out and can cause split ends. If you damage your natural hair you know it will grow back. If you use heat on your hair extensions then the damage will be permanent and you’re reducing the length of time they’ll look healthy and glossy for. Remember to take care of your hair extensions every day. Use a gentle shampoo and conditioner designed especially for extensions and you’ll keep them in shape for longer. You know how it is, you dress and style yourself depending on your mood. It’s the truth; we go for a wavy, relaxed hairstyle when we’re feeling feminine and floaty; we’ll opt for a no nonsense up-do when we mean business. So what about when you want to make a huge impact? Well, maybe go for Rita Ora’s ‘origami’ hair. This is the ultimate top knot and it was spotted on the singer at London Fashion Week. Check out all the people taking pictures in the background. This is a hairstyle designed to make a maximum stir. So how to recreate it? The faux fringe here it cut really short. Chances are if you don’t want to commit to that you can wear a wig or a hairpiece to cover your own hair. Ask your stylist to fit it for you and trim the fringe how you want it. Dream Girl’s Chic Collection comes in a range of shades included blonde, dark brunettes, browns and combos. You can also style the fringe as part of the hairstyle itself, but it takes a little work. It’s what Rita’s stylist has done so follow our steps to recreate it for yourself. Preparation is key in this style. You’ll need wax and hairspray to comb and style your hair so it’s straight and manageable. If your hair isn’t quite long enough then use a Dream Girl Ponytail Extension that clips or ties over your natural hair and adds length. Comb hair into a very high ponytail right on the crown of the head. Ensure there are not strands left and that hair is tied quite tightly in place. Secure with a transparent bobble. Use hairspray to smooth down hair. Next turn to the ponytail. Comb and use hairspray to stiffen slightly and comb again. Fold the ponytail in half front ways. The length of hair should fall over the front of your head, like a fringe. Check hair in the mirror. Ensure the “bun” is a uniform shape and there’s a good gap in the centre. Tie with a bobble around the base of the bun to fix in place. Spray the “bun” with more hairspray. Now you can work the fringe. The ponytail ends are sitting on your forehead. You need to smooth the edges down so it looks like a natural fringe. Using , yes more hairspray, fix hair in place and comb it flat. You might need to trim a few ends to ensure there aren’t huge differences between strands. And you’re ready to go. Rita goes for heavy lined eyes and a very dark berry lip to finish the high-impact look. All you need now is to master the attitude to go with it! What do Adele, Lady Gaga and Beyonce have in common? Well, apart from their fantastic voices and the amazing music they make, obviously. It is that, over the last year, they have been three women happy to talk about how they rely on wigs to boost their natural beauty. This week a feature in The Guardian talked about how wigs have gone mainstream and how they can be the must-have beauty item if you are prone to bad hair days. Dream Girl’s Chic Collection offers a perfect example of how you can mask your natural hair with a stylish and glossy alternative. Your natural hair might be dry, or frizzy. It might style perfectly everyday, except for the day you’ve got a big night out with the girls planned or you’re invited to a summer wedding. Teasing, crimping, curling, styling; there is nothing more frustrating than hair that just won’t behave itself. 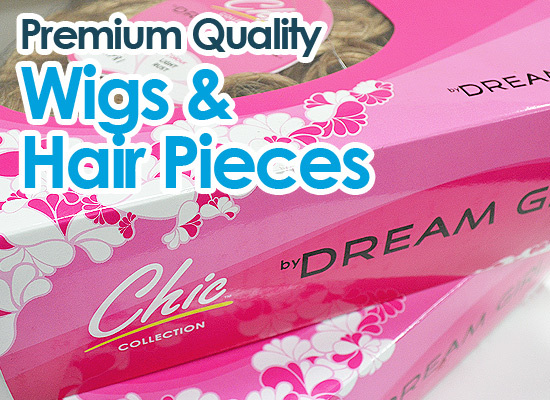 Investing in a wig from Dream Girl’s Chic Collection could help make those bad days a little easier. The most popular wig on our online shop right now is Kisna. It is a dark-haired bob with a fringe and layered curls. You can choose from a variety of styles, lengths and shades to match your natural colouring and style. Every wig in the Chic Collection is made from premium quality hair meaning the style is glossy and natural looking. To fit a wig simply tie back natural hair and pin down to ensure it is as flat as possible. You want to match the nape of the wig to the nape of your neck. Hold this section first and tip your head forward slightly. Slide the wig from the back to the front ensuring it fits comfortably in the same way you might a swimming cap. Check in the mirror to ensure the wig sits properly and is comfortable. A wig can be trimmed by a stylist to change the style to suit you. You can also style the hair to keep it looking sleek and neat. The popularity in wigs might have come from superstars but it is the ideal investment for anyone who wants to chop and change their style and enhance their natural beauty. We may say we’ve got blonde hair, brown hair or red hair, but in truth our hair is usually made up of loads of different shades. Take a section of your hair right now and hold it up to the light. Even the darkest chocolate brown will have flecks of auburn maybe, deeper shades of brown and perhaps even blonde. The range of shades in your hair gives it a natural depth and it’s often the element that Hair Extensions forget about, making them look fake rather than blending in naturally to your own hair. Hair Extensions, you see, just enhance your natural beauty, so add volume or length, but blend seamlessly with your own hair. If they are one block colour, this won’t happen. It also makes it harder to match to your natural shade. 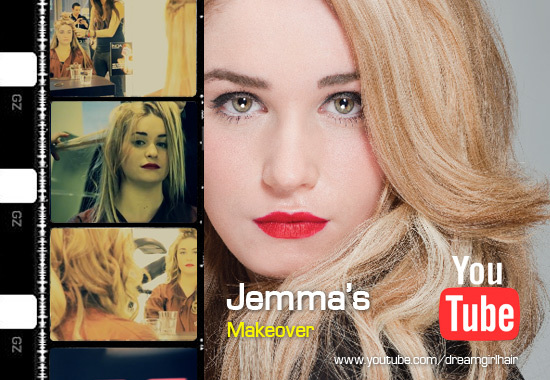 In Dream Girl’s latest You Tube video you can watch model Jemma getting Hair Extensions glued to her own hair. Beginning at the nape of the neck the extensions are cut to fit the shape of her scalp and are then attached to her own hair. The extensions are secured with glue and then blow dried to help them stay in place. Jemma’s hair is then blow dried to add even more volume, ready for her photoshoot. As you’ll see when you watch the film, Jemma has lovely long blonde hair. But there are a range of colours in there from lighter to darker blonde, as well as some flashes of brown. The Hair Extensions Dream Girl fitted to her hair needed to add a bit of wow factor to her look so the stylist opted for extensions that blend together different colours. If you use Dream Girl’s Colour Comparator you will see that you can choose 100% Human Hair Extensions which offer several shades, like Light Honey Blonde and Lightest Blonde or Caramel Blonde, Dark Blonde and Lightest Blonde. Hair looks more natural and creates a more stylish and beautiful finish. Watch the film here for tips on how to style and wear your own Dream Girl Hair Extensions. Let’s be honest, hair extensions are good fun. You can transform your short pixie crop into long luscious locks in minutes; turn yourself from a brunette to a brilliant blonde or experiment with funky pinks, reds and even blues. For confident women who like to play with their look and style, hair extensions are a perfect way to make you feel glamorous. But with every other product that becomes part of your beauty routine, you want to know where it comes from. Ethics, as well as knowing how a quality item is produced, are of vital importance to both the consumer and to salon who may install your extensions for you. Dream Girl works hard with our suppliers to make sure each and every hair extension we stock and sell is of the highest quality. So have you ever wondered how hair extensions are made to look so natural and beautiful? The most popular type of hair extensions, both Clip’N Go and those sewn in are made from 100% human hair. The highest quality and most expensive is Remy Hair. This comes from India and is 100% natural human hair. It is sourced ethically and Dream Girl works closely with its suppliers to ensure this. Remy hair still has the cuticle layer, right at the top of the hair strand. The reason for this is how it helps to control the flow of your hair. The most natural look is when hair falls in the same direction along a natural parting. Keeping the cuticle in the hair helps this process because if each cuticle layer of the hair is laid in the same direction, the hair will fall and settle more natural when made into a hair extension. The cuticle layer also makes sure hair doesn’t become tangled, makes it shiner and healthier and means the hair extensions can last longer. Asian hair is at once fine and strong, which is why it is so popular for hair extensions. It means it’s easier for the consumer to style and use every day, without worrying about damage. The hair is sewn together ensuring it can either be added to the head via stitching, that is sewn in in sections by stylist, or turned into Clip’N Go hair extensions which can be clipped to existing hair easily. Each hair extensions is cleansed and processed before being sold to the consumer. This ensures it is as healthy as possible. Dream Girl works with a supplier in China who cleans the hair and then makes the hair extensions. This is where expertise becomes so important. Great care is taken to ensure each strand is sewn in the same direction, protecting the root and cuticle layer to make sure there is a better finished product. From there the hair is packaged and sent to the UK, where it is sold to salons and consumers across the country. The beauty of hair extensions is that it gives you the freedom to change your hairstyle as often as you change your shoes. If your hair is fine and flyaway, a few Clip’N Go Hair Extensions or a more long term solution with Euro Weft or Remy Silky with hair extensions either sewn in or glued to your hair, you can transform your look into a thick, full-bodied and volumised style. Sometimes some girls think hair extensions mean you have to wear your hair loose and flowing all the time. Yes, hair extensions look great loose, but it doesn’t mean they can’t be used to recreate a stunning up-do perfect for weddings, formal occasions or proms, or even just when you want to style your hair a little differently. Here is a guide for how to recreate three up-dos using hair extensions. It’s a classic look that can be transformed to look casual or formal, depending on what kind of evening you have planned. Hair can be worn either in a side parting, middle parting or brushed back, depending on your preference. Comb hair back as though styling into a low ponytail. From the nape of the neck, gently twist hair upwards, overlapping the twist with hair from above. Keep going until you reach the end and tuck into the folded hair. Fix gently with grips from the nape up the neck up to the crown. For a more formal style ensure any loose hair at the sides, fringe or layers, is secured to give a clean look. For something a little more casual, allow layers to frame the face. SJP made this bun her own in SATC and it’s easy to recreate yourself with a synthetic hair piece or ponytail you can fasten or clip into your own hair. Simply tie your hair back, securing into a bun. Clip the hair accessory over your own hair. Take sections of the ponytail and wrap around fixing with grips as you go. The aim is to have a voluminous bun, defying gravity. It looks best if your fringe or any side partings are secured with either clips or hairspray. One of our favourite hairstyles at Dream Girl the half-up do provides instant style and glamour as well as length. Clip’N Go Hair Extensions come into their own with this style as the clips are easy to conceal and they add instant volume and fullness. Blow dry hair normally, paying particular attention to the roots to add volume. Clip on hair extensions on the crown of the hair first. This will add volume initially when you tie the hair back. Start with you thumbs over the ears and separate hair into a hair ponytail. The hair extensions will have added a fuller look at the roots. Secure either with clips or a hair bobble. If you look at yourself side on in the mirror you’ll see there is a line around your hair, from the side of the ponytail to the hair that is still falling loose. You can use this line to cover any hair extensions you clip in to add added length and volume to the style. The Half Up-Do looks particularly glam with waves and curls for a style that works in the day and at night. If you’ve had hair extensions added to short hair (your hairs has to be minimum an inch long to have hair extensions) and are worried about people seeing the join then the hairband is your friend. You can use a wide band or ribbon to tie around your head providing a funky style or accessory. To add volume to the roots, tip your head upside down and direct the hairdryer towards the roots. Want to secure the style for longer? Use a cool setting once you’ve finished styling your hair. It will help it keep its shape.